Sundar Pichai, Google’s senior vice president for Chrome and Android today announced that the company’s Chrome browser now has more than 750 million monthly active users. 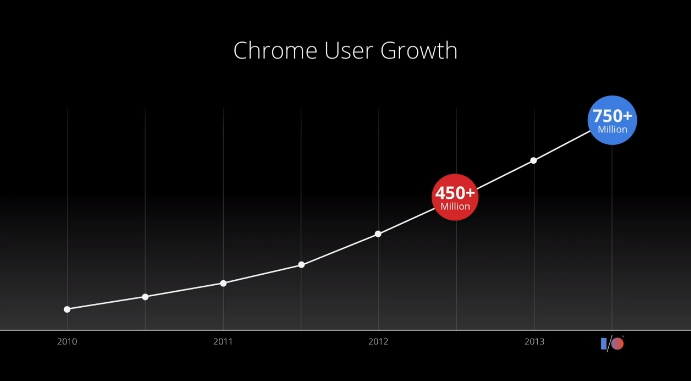 That’s up from 450 million users Google announced at last year’s I/O. This number, as far as we can see, includes both desktop and mobile users. Google launched Chrome in 2008 and since then, as Google proudly noted in today’s keynote, it has become the most popular browser in the world. It is also now, as Pichai noted early on in the keynote, a very important platform for Google that stands side-by-side with Android. Just recently, Google also decided to take more of the development process of Chrome in its own hands when it dropped WebKit and decided to start developing its own Blink rendering engine based on WebKit.